March 30, a day set aside to raise awareness of the disorder and erase the stigmatism of mental illness. 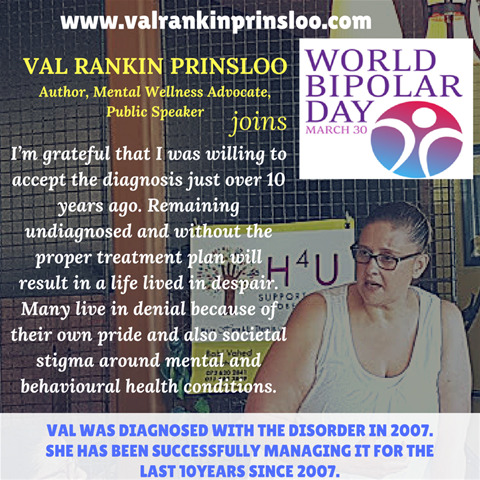 Val Rankin Prinsloo, Author, Mental Wellness Advocate & Public Speaker invites you to listen to her address awareness in our communities about Bipolar Mood Disorder. The 30 March 2018 is World Bipolar Day. The movement motto is Strength for Today, Hope for tomorrow. 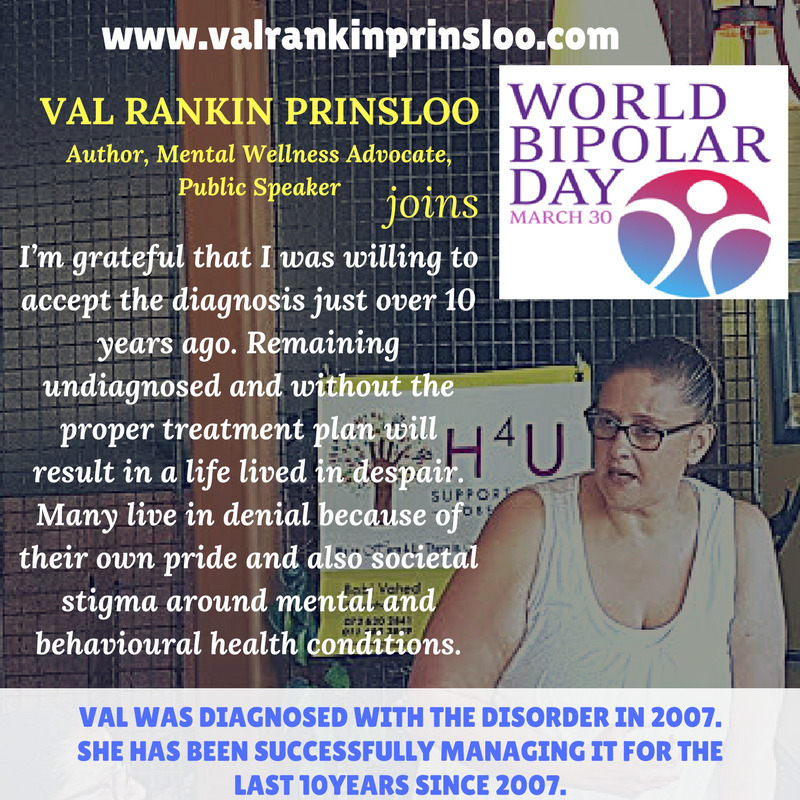 The vision is to bring about world awareness to Bipolar Disorders and to eliminate social stigma. As part of her support for this day she will be participating by giving first hand experiences in the hope of providing education regarding the disorder. Val was diagnosed with the disorder in 2007. She has been successfully managing it for the last 10 years since 2007. We are all members of communities where this disorder is often misunderstood and not diagnosed. Being able to identify the signs and symptoms and learn about where we can find treatment for ourselves or other community members will surely bring relief. Do you know what it feels like to be diagnosed with Bipolar Mood Disorder? No pun intended, but it’s a difficult “pill to swallow” Medication usually does leave a bitter taste in the mouth, but usually effective in healing nonetheless. I’m grateful that I was willing to accept the diagnosis just over 10 years ago. Remaining undiagnosed and without the proper treatment plan will result in a life lived in despair. Many live in denial because of their own pride and also societal stigma around mental and behavioural health conditions. A bipolar mood disorder diagnosis is made by taking careful note of the severity, length and frequency of mood swings. Everyone goes through day to day ups and downs so don’t just label yourself or anyone else, get a proper diagnosis. I suffered many bouts of an unusually elated moods, irritability, increased energy, insomnia, racing thoughts and speech. These bouts would be mixed up with periods of extremely low moods, hopelessness, confusion, numbness and worthlessness. When you take the time and are willing to describe to a medical professional or even a Bipolar Mood Disorder sufferer, these marked changes in mood can be matched up with some kind of mental and behavioural issue. I encourage anybody who can identify changes in themselves or others, to seek medical attention. Someone who has the experience with treating these disorders will talk with you and note your personal and family history to see if there is a genetic component responsible for your irregular moods. They will also help you identify where there is outside behavioural factors that could be causing you to remain in turmoil. You will learn how to set and maintain boundaries in your own life. It isn’t necessarily the case that there is a family history, but it was in my case. Be observant of the different states such as mania (elevated mood) and depression, anger, aggressiveness, paranoia, hallucinations. Some can be subtle and some are very much in your face. Note where there are issues like alcohol abuse, contraband which often go hand in hand with mental illness, but don’t just assume that all substance abusers have a mental health condition. Then work of sorting all of this out and finding the correct treatment plan. Be prepared for the long life-time haul as this is not something that can be cured. It can however be managed very successfully. Stay in treatment and be a proud warrior of mental illness. Don’t accept being discriminated against. Walk your journey with pride. And when you need help, please ask for it. We are not alone. My life is nowhere near perfect, but it is a whole lot better than it was before. We just need to be aware of the behaviours and exercise understanding and acceptance of the need for treatment.